In the years before the outbreak of the war in the Pacific, Guam was a paradise for the Navy, Marine and civilian employees of Pan American Airways, who found themselves stationed on the island. However their apprehension about the fate of the island increased as they anticipated a Japanese attack in the fall of 1941. Shortly after attack on Pearl harbor, Guam was bombed and the Japanese invasion soon followed.. Since Guam was not heavily fortified it soon fell to the invading Japanese. In the takeover of the island, the Japanese practiced a swift brutality against the captive Americans as well as native population, and then immediately removed the American military and civilian personnel to Japan. Only a lucky few escaped, including five Navy nurses and dependent Ruby Hellmers and her baby Charlene, who were transported back to America aboard the Swedish ship Gripsholm in mid-1942. In Captured, Mansell tells the story of the captives from Guam, whose story until now has largely been forgotten. Drawing upon interviews with survivors, diaries and archival records, Mansell documents the movements of American military and civilian men as they went from one Japanese POW camp to another, slowly starving as they performed slave labour for Japanese companies. Meanwhile, he describes the brutal horrors suffered by Guamian natives during Japan's occupation of the island, especially as the Japanese prepared for American forces to re-take this U.S. possession in 1945. Moving stories of liberation, transportation home and the aftermath of these horrific experiences are narrated as the book draws to a close. Mansell concludes that America's lack of military preparation, disbelief in Japan's ambitions in the Pacific and focus on Europe all contributed to the captivity of more than three years of suffering for the forgotten Americans from Guam as the Pacific War raged around them. Captured was completed by historian Linda Goetz Holmes after the death of Roger Mansell. 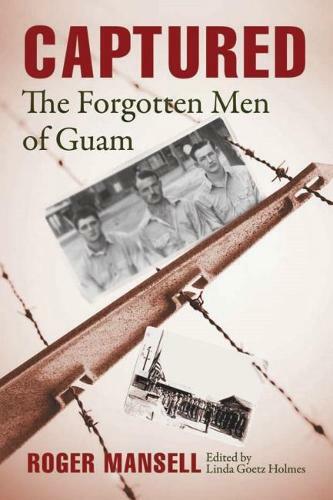 "Roger Mansell's Captured is a beautifully written, richly researched account of the fall of Guam and a searing reminder of the horrific ordeal suffered by American prisoners of war at the hands of the Japanese."